FX’s remarkable new Mexican border drama is an immediate must-watch. In 2011, this translated into 5.7 murders every day in a place Global Direct Investment Solutions called “the city of the future.” Chicago, a city of 2.7 million, is suffering through its own pandemic of killing. In 2012 this meant 506 murders, or 1.4 every day. In the decade since Bolaño’s passing, cable television has become expert in telling a particular kind of story, one in which it takes a transgressive setting — the Mafia, a funeral home, Baltimore — and uses it as a cursed mirror to reflect on some greater truth about American society. The best dramas have forced us to recognize the darkness in ourselves and ourselves in darkness. But even during its vaunted Golden Age, television has shied away from telling a particularly hellish tale, one with tendrils that reach into the backlots and boardrooms of Hollywood. TV isn’t the only medium to mostly ignore the violence that has ravaged Mexico, of course,2 or treat the country as a garishly lit3 other populated solely with scrabbling hard cases or subservient poolboys. It’s just the most unfortunate because television, with its expansiveness of time, character, and tone, is uniquely suited to capture the blood-streaked shades of gray Mexico’s rough recent history demands. (Still dubious? Watch Traffic again. I’ll wait.) What’s more is that, when entrusted to the right hands, a story about Mexico in 2013 is, invariably, a story about us. And a notable exception to this is Breaking Bad, which, with trademark meticulousness, has connected the dots between Walter White’s Scarface dreaming and the more vicious, nuts-and-bolt-cutters version of the meth business located on the other side of the border. I call this the “Chino effect” after the way Ryan Atwood’s “dangerous” home turf on The O.C. was filmed through an exotifying filter that made a corner of the Inland Empire look like the Martian hellscape at the end of Total Recall. The Bridge, premiering tonight at 10 on FX, seeks to tell that story and, in the early going, it tells it well. Based on a successful Danish series4 and shepherded by Homeland writers’ room MVP Meredith Stiehm and novelist/Cold Case producer Elwood Reid, the show smartly relocates the original’s premise from the no-doubt fascinating frontier between Denmark and Sweden to the far more turbulent border between El Paso and Juárez. In the opening moments of the pilot, a body is discovered abandoned at the midpoint of the Bridge of the Americas, the heavily trafficked crossing between the two cities. The severe American cop, Detective Sonya Cross (Diane Kruger), recognizes the corpse as that of an anti-immigration judge. Her Mexican counterpart, Detective Marco Ruiz (Demián Bichir), is just used to death. (“We have lots of bodies,” he shrugs wearily.) She takes the case and he takes his leave. But when the corpse is revealed to be two dismembered halves, one gringa and one chava, jammed together across an international line, Cross and Ruiz are forced into an uneasy partnership. The Killing was also adapted from a Danish series by a veteran of CBS’s Cold Case. This is a coincidence and — thank goodness — nothing more. In her hands, The Bridge crosses effortlessly between worlds: night and day, crime and punishment, genre procedural and lyrical meditation. When the goings get grim — and with teenage prostitutes, homeless huffers, and literal ticking time bombs in the first two hours, they get grim in a hurry — the violence feels like a necessary slap to the face, not a cheap punch to the gut. In recent years, the traffic between El Paso and Juárez has flowed primarily in one direction: north. Thousands of Mexican nationals cross the border on a daily basis for shopping or, like Detective Ruiz’s teenage son, school, while increasingly fearful Americans stay on their side, convinced that the terrible things occurring in Juárez will never bleed into their backyards as long as they stay close to them. But The Bridge‘s pilot, as lensed by Miss Bala director Gerardo Naranjo, paints El Paso and Juárez not as distinct cities but as mirrored chambers of the same diseased heart; his camera lingers on the snaking highways and byways, choked with cars like clotted blood. Before the bodies can even be removed from the bridge, there’s a palpable sense of leakage, that no armed guard or strident ideology can ever possibly hope to keep the barrier secure. Listing precariously above this maze are the two leads, Kruger and Bichir, and both are exceptional. Kruger has the showier role: Though it’s not explicitly stated, her Sonya Cross has Asperger’s syndrome, a shade on the autism spectrum that grants her a ferocious intellect and a serious lack of empathy. Cross understands the letter of the law but not the spirit: She initially refuses to let a dying man’s ambulance drive through her crime scene, and her idea of comforting a new widower is to assure him that his wife was already dead when he tried to text her. A German-born former model who once played Helen of Troy, Kruger is no one’s idea of a Texas homicide detective, but the character’s condition, and Kruger’s dedication to playing it straight, goes a long way toward explaining the incongruity. So does her appearance: Sans makeup, Kruger’s porcelain skin looks eerily translucent. Couple that with her unblinking eyes and horse-bedazzled jean jacket (!) and the border-patrolling Cross comes across as an alien in her own right, caught somewhere between Sil from Species and a stage-fright addled Aimee Mann. She’s both all-in and barely there. This icy remove is a perfect counterpoint to the rumpled warmth of Bichir. His Ruiz is the latest in a long line of “last good cops in Mexico,” an amiable cliché that stretches from Charlton Heston in Touch of Evil and Benicio del Toro in Traffic to novels like Martin Solares’s The Black Minutes and Bolaño’s own tortured foray into a fictionalized Juárez, 2666. Bichir, a Mexico City native, played the mayor of Tijuana on Weeds and was nominated for an Oscar in 2012 for his brilliant turn in A Better Life. But as good as he’s been before, he’s even better here. Within seconds of meeting Ruiz I’m already prepared to spend multiple seasons riding alongside him, buying breakfast pastries from street vendors and sighing at the casual cruelty of the world. While his peers earn extra pesos working security for drug lords and his boss jukes crime stats to save his own bacon, the stalwart Ruiz soldiers on, averting his eyes and seeking refuge in his wife (fellow Oscar nominee Catalina Sandino Moreno) and kids. What makes the performance great is the way Bichir plays Ruiz’s incorruptibility as something close to an inconvenience: He’s clever but unambitious; a clock-puncher, not a crusader. At least that’s how he thought of himself before he got a taste of the cheap coffee and straight shooting of the El Paso PD. The killing that draws him north appears to be part of a larger sociopolitical statement about the value of white lives vs. brown, and the zeal with which Ruiz signs up for the hastily formed task force5 seems to surprise everyone, including himself. At first it could almost be played for laughs the way an irritable Cross bulldozes right over Ruiz’s more sensitive touch.6 But the longer they collaborate the more it reads as a sly commentary on the bumpy working relationship between the U.S. and Mexico, the way the former demands cut-and-dried results in the wars on drugs and illegal immigration and leaves it to the latter to cut the corners necessary to achieve them. Cross is a square peg and Ruiz’s Mexico is a vast, cavernous hole. As befits a show called The Bridge, Stiehm parks her characters right in the murky middle, has them flit between English and Spanish, and sets up her protagonists on a quest to piss everyone off simply by doing their jobs. One of the highlights of said force is Johnny Dowers as the fancy-mustached Detective Tim Cooper. I have no idea if Cooper is meant to be a good cop, but Dowers plays him like a pistol-packing Seth Galifianakis and chows down on nearly every scene he’s in. The pilot’s lone false note is when Ruiz has to explain to Cross about the missing girls and women of Juárez. She’s a workaholic with zero social life and a voracious appetite for the grim and grisly. We’re to believe she doesn’t at least scan the local news? The first few episodes of The Bridge aren’t an easy watch. The pacing is deliberate, the relationships subtle, and the canvas broad. Spiraling out from the main investigation, in concentric circles of intrigue, are Gish’s sprawling ranch and the secrets it contains,7 the back roads traversed by would-be illegal immigrants and the shady coyotes who take their money along the way, and the local newspaper where bombed-out former New York Post–ie Matthew Lillard forms a cross-cultural partnership of his own with an earnest Mexican American reporter played by Emily Rios. It’s both vital and refreshing the way a show centered on the violence and unrest in Mexico takes great pains to present a proud and complex country not entirely consumed by its demons — and to demonstrate how Juárez, while technically part of Mexico, is as close to the United States culturally as it is geographically. This expansiveness helps put to rest any fears that The Bridge, by choosing to build a season around a single case, might come off as slight or, like The Killing, devolve over time from a promisingly tart ceviche into a pile of cold red herrings. The journey already feels rich enough to validate the destination, no matter when it arrives or what it may be. Among the better secrets? A creepy Lyle Lovett as the Saul Goodman of West Texas. It was Stiehm and Reid who successfully lobbied to set the show along the Mexican border — the producers were initially scouting locations around Detroit and Canada — and to their great credit they seem committed to doing justice to all aspects of this lawless frontier. In a recent interview with Alan Sepinwall, Stiehm name checks The Wire as an inspiration, and while that has become an invocation as common to showrunners as Jesus is to NFL running backs, in this case it’s both relevant and heartening. 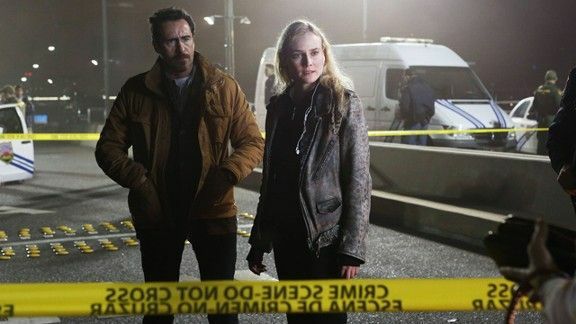 Like David Simon’s interlocking, uncompromising masterpiece, The Bridge manages the neat trick of being both tough and entertaining; it’s a made-up story that feels true. This article has been updated to correct Chicago’s daily murder rate in 2012.